Thank you for attending the 2018 Ruby Awards! An Outstanding Resident Leader is an individual residing in affordable housing in our region who has played an important role in promoting the creation of more affordable housing and/or enhancing how affordable housing improves the lives of residents and local communities. The Ruby Award went to Miguel Figueroa of Paradise Creek Apartments in National City. Miguel is a Community Volunteer Leader and graduating high school senior. He leads the Community Center and afterschool-learning program, providing a fun, supportive, and safe place to learn. Miguel exemplifies the powerful impact of youth engagement. Outstanding Service to Residents goes to an individual employee, volunteer, team, or program that is going beyond the call of duty to make a difference in the lives of residents. The Ruby Award for Outstanding Service to Residents went to Dennis Dearie, Director of Supportive Services at Serving Seniors. Working with a cross-section of the most vulnerable seniors in our community, Dennis creates a welcoming environment in which his efforts are tailored to the particular individual. He has even mentored and inspired dozens of student interns working with the older adult population. An Outstanding Advocate is an individual or organization who is raising their voice so that we can all raise ours. The Ruby Award for Outstanding Advocate went to Jackie Camp. Jackie was appointed to the City of Oceanside Housing Commission in 1999 and continues to serve today; she is their longest serving housing commissioner in history. She is a lifelong proponent and fierce warrior of affordable housing production in Oceanside, and she is a staunch advocate of high quality, universal design, and the implementation of the Americans with Disabilities Act in all affordable housing developments and public improvements. The SDG&E Energy Efficiency & Sustainability Award for New Construction recognizes a new construction affordable housing development that promotes energy efficiency and/or sustainability in their design and construction. The Ruby Award went to North Park Seniors from Community HousingWorks. North Park Seniors reflects the best principles of sustainability including energy and water efficiency, transit-oriented location, and sustainable design to encourage and promote healthy living. North Park Seniors is a 194-apartment, LGBT-affirming, transit-oriented development completed in December 2017 in San Diego. This award recognizes an outstanding supportive housing project, organization, or individual leader in San Diego. Nominees in this category are completed housing developments that have a focus on supportive services to enable people to end their homelessness. The Ruby Award went to Talmadge Gateway from Wakeland Housing and Development Corporation, St. Paul’s PACE, and City Heights CDC. Talmadge Gateway is a project that has transformed San Diego’s approach to addressing homelessness for older adults by effectively weaving together PACE services, affordable housing, operating subsidies, and referrals flowing to the property through the Coordinated Entry System. Talmadge Gateway embodies all of the key elements of quality supportive housing. In the category for Outstanding Development Partner, the nominees exemplify what it means to be partner who provided outstanding support on an affordable housing development. The Ruby Award for Outstanding Development Partner went to LISC San Diego. Having recently celebrated their 25th anniversary, LISC San Diego was a crucial early partner and investor that made many affordable housing projects in San Diego possible. According to the San Diego Business Journal, LISC—in its 25 years in San Diego—has invested $232 million in grants, loans, and equity investments in low-income communities in San Diego, leveraging $1 billion in total development. That has led to the creation of more than 6,000 affordable rental housing units and the development of over one million square feet of retail and commercial space. Nominees for Outstanding Government Agency or Elected Official took unusual risks or initiatives to support affordable housing and community development. The Ruby Award for Outstanding Government Agency or Elected Official went to two individuals this year: Senator Toni Atkins and Assemblymember Brian Maienschein. Senator Toni Atkins, a Democrat representing San Diego in the California State Senate, is a long-time advocate in the fight to improve California’s affordable housing dilemma. Her introduction of Senate Bill 2 (the Building Homes and Jobs Act) during the 2017 legislative session was essential in creating a permanent funding source for affordable housing and decreasing regulations for affordable housing developers. Toni’s efforts are pivotal in addressing the housing crisis and will surely improve the quality of life for our residents and California’s future. In the past year, Assemblymember Brian Maienschein was the only Republican who voted yes on SB2, the measure to create a permanent funding source for affordable housing. On his critical vote, Brian said, “To do nothing for me is not an option.” Currently, Assemblymember Maienschein is coauthoring AB 3171, a $1.5 billion request from the Big 11 Mayors that would provide matching grant funds to cities that are working towards helping people who are homeless, including housing for these individuals. The Innovations Award encompasses new and interesting ideas in housing or services. The Ruby Award went to North Park Seniors from Community HousingWorks. North Park Seniors is recognized for its pioneering use of density bonuses along with its innovative approach to housing the LGBT senior community in what is sure to become a national model. North Park Seniors is one of only a handful of developments in the nation that is designed to have an affirming and supportive environment for lesbian, gay, bisexual, and transgender seniors. Our next award honors a public employee who has taken unique risks or gone above and beyond the call of duty to facilitate the creation of affordable homes in a community or jurisdiction. The award is bestowed in memory of John Craven, one of San Diego’s most dedicated housing development officials. The John Craven Memorial Award went to Rachel Hurst, most-recently from the Community Development Agency of the City of Coronado. Rachel Hurst is a seasoned city administrator with a career spanning over 35 years in several different California jurisdictions. She has been visibly dedicated to redevelopment, housing, land use, and planning issues. Rachel recently retired from the City of Coronado where she served for more than 11 years as the Director of Redevelopment and Housing Services and then the Director of Community Development. This award recognizes excellence in affordable housing developments that were acquisition or rehabilitation projects completed in San Diego County between January 1, 2017 and December 31, 2017. The Ruby Award went to Woodglen Vista from Jamboree. Last year’s property rehabilitation of Woodglen went above and beyond the typical property refresh. The 2017 rehab of this 40 year old property was focused on both improvements in the individual units and an overhaul of the major components of the property infrastructure. This award recognizes excellence in affordable housing developments completed in San Diego County between January 1, 2017 and December 31, 2017. The Ruby Award went to Atmosphere from Wakeland Housing and Development Corporation. Wakeland Housing took a blighted site that had been vacant since 2004 and transformed it into a stunning example of community development. The project serves a diverse group of residents and includes 51 units of permanent supportive housing with wraparound services for formerly homeless individuals. Congratulations to the 2018 Nominees! Wesley House Student Residence, Inc.
One of SDHF’s signature events, the annual Ruby Awards is the county’s largest affordable housing industry recognition event honoring the best people, projects, and achievements during the past year. Every year, hundreds of housing and community leaders from across the region and around the state will be on hand to applaud winners in more than a dozen categories and be inspired by their achievements. 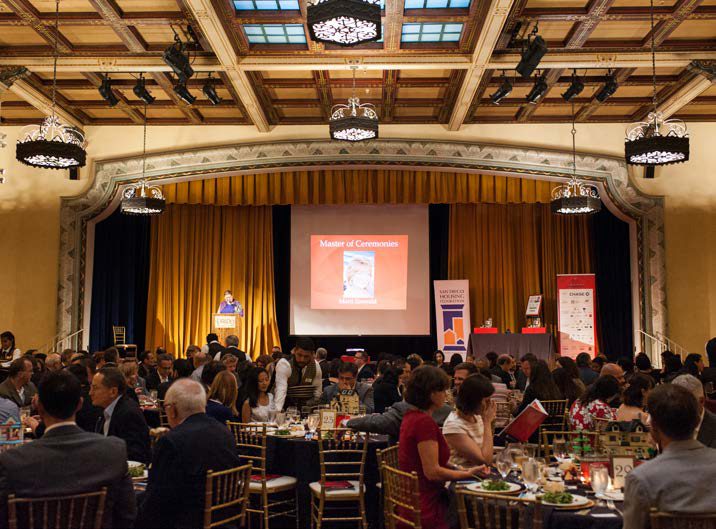 The Ruby Awards recognize excellence in affordable housing and community development, highlighting the accomplishments of people, agencies and developments that work to ensure all San Diegans, regardless of income, have a safe, stable place they can afford to call home. Call for Nominations is closed. Thank you to those who submitted. Nominees will be announced the week of March 5th. Show your support for excellence in San Diego Affordable Housing and consider a sponsorship in 2018. Full sponsorship packets and other opportunities are available. This packet details the various SDHF membership and sponsorship opportunities available along with corresponding benefits, allowing you to choose the options. Thank you to the following organizations and individuals for their generous donations towards the 2018 Ruby Awards event! Thank you to the Craven family for generously sponsoring this award by donating $1,000 to a non-profit organization of the winner’s choosing. For questions, please contact Sarah Buchanan, Director of Events and Membership via email or at (619) 239-6693. Contact Sarah Buchanan with any questions.